I'm trying to figure out if there's an album title you could come up with that would draw my attention more than Pop Punk Is Back? While I think the term pop punk has undergone many changes and meanings over the years, at this point I've really embraced it as a catch all term for the kind of music that I tend to like. Will some people think of terrible bands when you say 'pop punk?' Sure, but why let a few bad apples spoil the bunch. 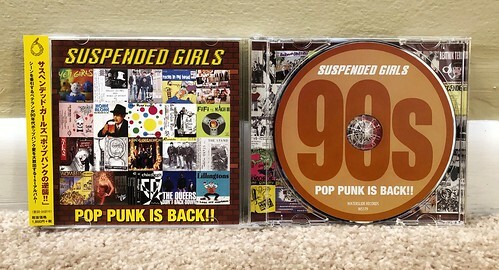 Suspended Girls are from Japan, like most of the great pop punk bands of the moment. They feature some punk rock veterans who have done time in bands like Disgusteens and Nobodys and the album artwork is essentially made of of smaller images of other pop punk album covers, predominantly from the 90s. If this doesn't give you a vague idea when Suspended Girls sound like, I'm not sure what words I could write to clue you in. I will of course alert you that the songs are very catchy and upbeat, drawing huge inspiration from the 90s era bands that drew inspiration from the Ramones. If anything, their sound seems more indebted to America bands than the sort of Japanese bands I was listening to in the mid 90s. They use simple, snappy chord progressions and top them off with melodic vocals along with occasional shouts or 'ooohs' in the background. It's a real blast from the past, even though this album just came out in 2018.